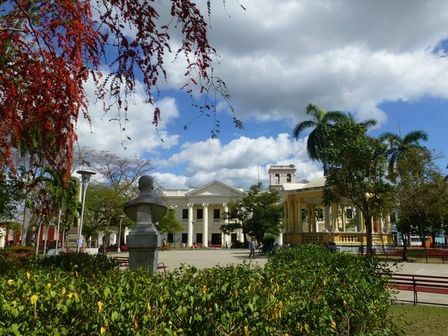 Things to do in Santa Clara, Cuba. A short list of the top things to do in Santa Clara. Don't go to Santa Clara without looking at this list first! Edgy Santa Clara is home to many homages to revolutionary Che Guevara, a very popular heavy metal festival, and Cuba's only drag show. The best things to do in Santa Clara are attend the rebellious events that push the Cuban censorship policies and learn about Che Guevara whose revolutionary spirit still pulses in the streets. This legendary dive bar is just off Parque Vidal. Locals from all walks of life hangout here so it's the perfect stop to get a taste of daily life in Santa Clara. Anyone who wants to learn about Che Guevara must make a stop here. The museum covers his life and death in intimate detail and he is buried in the mausoleum. This tiny museum in a boxcar is one of the top things to do in Santa Clara. It covers the 90 minute battle that took place when a group of revolutionaries derailed a train full of armed government troops and the decline of the Batista regime began. The laid-back tour at this tobacco factory is one of the top things to do in Santa Clara and one of the best tobacco factory tours in Cuba. After the tour you can purchase cigars to bring home or to enjoy on site with a cup of locally roasted coffee. Santa Clara's cathedral was built in 1923 and has incredible stained glass windows that are one of the must see things to do in Santa Clara. A mythical white statue of the Virgin Mary is very special to the church as it was lost shortly after the church was consecrated but found again in a ditch decades later and restored.